Shifting the temperature just a few degrees higher or lower can render a vaccine ineffective. This potentially leads to millions in lost revenue—and worse, a loss of trust among consumers as word spreads about the need to re-vaccinate. Onset, a world leader in data loggers, is addressing this challenge with the debut of the InTemp CX400 Series pharmaceutical cold chain management (CCM) products. The new InTemp CX400 Series is the first pharmaceutical cold chain monitoring solution that combines Bluetooth Low Energy (BLE), robust alarm functionality, and automated report generation into one small, easy-to-use logger. The series includes a range of high-performance data loggers for monitoring temperatures in refrigerators, freezers, and other temperature-controlled environments. These loggers can then transmit data and alarm states via Bluetooth to any mobile device running the InTemp app. In this way, the CX400 Series provides an affordable and highly accessible alternative to manually driven monitoring solutions that are susceptible to error and have contributed to vaccine failures around the globe. 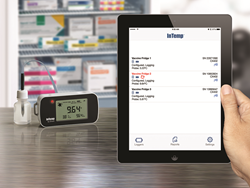 Building on Onset’s 35-year leadership in temperature data logging technology, the InTemp CX400 Series enables clinics, pharmacies, hospitals and pharmaceutical firms to follow the Centers for Disease Control and Prevention (CDC) recommendation on using digital data loggers for continuous temperature monitoring. Additionally, it meets CDC requirements for calibrated temperature monitoring with devices backed by a Certificate of Calibration Testing. Designed to simplify compliance with CDC vaccine monitoring guidelines, InTemp CX400 loggers dramatically simplify the process by streamlining daily temperature checks, speeding up logger setup and download, and reducing the paper trail burden. The loggers feature an easy-to-read display of the current temperature, as well as the daily minimum and maximum. Featuring +/- 0.5C accuracy, they provide reliable temperature readings, and deliver both audible and visual alarms in the event of a temperature excursion or a disconnected temperature probe. With the BLE-enabled loggers, setup and data download are accomplished in seconds, without the need for a PC or cable, and the devices are battery powered to guard against local power outages. InTemp CX400 Series loggers are available in several hardware configurations, all of which include an internal temperature sensor. Loggers combining an external probe and glycol bottle ensure that the temperature logger readings simulate the actual temperatures of the refrigerated product. Probe-only versions are useful in situations where users need to track actual refrigerator temperatures, and models featuring only an internal sensor are suited for applications that simply require room temperature monitoring. CX400 Series loggers are complemented by Onset’s free InTemp mobile app. The InTemp app enables easy and efficient logger setup. It also allows users to choose from a range of preset configurations—for example, clinical refrigerator or ambient storage monitoring—as well as create custom configurations for other applications as needed. The app’s ability to download and send data in one simple step and share reports means employees can meet regulatory compliance requirements for storage monitoring quickly and effectively. It also provides flexibility in transmitting data, so information can be shared with multiple business units or departments. Additionally, the InTemp app can easily create secure PDF reports or export data into Microsoft Excel for advanced analytics, making information easily accessible for audits. Finally, it ensures security by enabling users to set encrypted passkeys that other mobile devices will require for connection to the logger.